Saturdays / Now on The Grove Plaza / 10:30am- 2:30pm through December 16th! The Founder of Waterwheel Gardens, Kurtis Williams, always loved growing things. He worked at McDonalds Nursery in Walnut Creek, California while he was in High School, and then majored in Ornamental Horticulture at Cal Poly in San Luis Obispo, California. He started woodworking in 1978 in order to pay the bills and raise a family, but always grew gardens, and passed on that love of growing things to his children. He helped start the Co-op and Farmer’s Market in SLO. His son, Matt, grew up working with him, building cabinets and doing remodels. 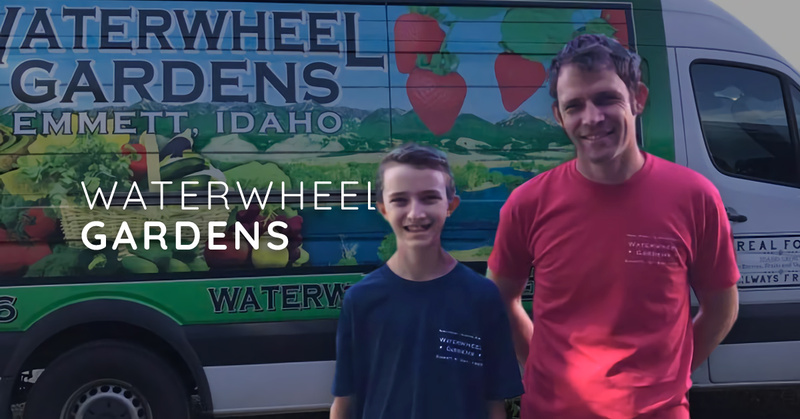 Kurtis and his Wife, Roxine, moved their Family to Emmett, Idaho in 1994 where they continued woodworking, but quickly started to see the demand for fresh locally grown produce and more vibrant Markets, so they started Waterwheel Gardens in 1995, on five acres of land on Waterwheel Rd. in Emmett. 22 years later, Matt is now the President of the Capital City Public Market Board of Directors, while working with Kurtis to run Waterwheel Gardens, which has expanded to about 20 acres, with lots of help from Roxine, three of Matt’s brothers, Jon, Noah and Ethan, and a few good friends. When asked about Waterwheel Gardens, Matt remarks, “working hard for what you love comes easy to me.” And Matt is absolutely correct. What Makes Waterwheel Gardens So Special? For years, Matt and his Family have planted a wide variety of unique and delicious fruit trees, berry bushes, and colorful, tasty veggies, many varieties that you would never find on a supermarket shelf, in large part due to how perishable many heirloom varieties are. Selling mainly at Farmer’s Markets around the area, allows for what is being sold at the Markets to be harvested just the day before, if not the day of Market! Using sustainable growing practices is another reason why the produce tastes as delicious as it does. Waterwheel Gardens incorporates a lot of compost into the soil for every crop they grow, as well as some cover crops, and lots of crop rotation. Their soil is quite sandy naturally, so it drains well, which is ideal for growing fruit trees, grapes, berries, etc. They also started raising chickens, last year, inspired in part by famous small farmer Joel Salatin. Not only are free-range eggs in high demand and delicious! running chickens through the fields and orchards also helps with some pest control, weed control and fertilization. Jared Lynch, a longtime family friend, who started working with Waterwheel a couple years ago, was the main catalyst for them deciding to raise chickens. He spent a good part of the Summer of 2015 building a chicken coop, on a trailer, so that it could be moved around the orchards and fields. It’s been quite successful and a second “Chicken Hotel” is in the works! This fall the focus has been on building a large 72’ x 22’ Greenhouse for the Farm to expand its early and late season offerings of Lettuce, Spinach, Herbs and hopefully Tomatoes. With the potential to grow some things all the way through the Winter. At the height of Summer, Waterwheel Gardens participates in six different markets each week! Tuesday in Ketchum (mid June - mid October) Wednesday in McCall (mid June - mid September) Thursday in Hailey (mid June - mid October) then on Saturdays they go back to McCall for that Saturday Market, and also do the Capital City Public Market (mid April until Christmas!) in addition to all of that, they do a year-round, small solo Market at Nourish Me, a Health Food Store in Ketchum, Thursdays through the Summer and Every Tuesday through the Winter! Waterwheel Gardens offers seasonal fruits, berries and vegetables, eggs, jams, dried fruit, and other canned goods. In the Spring, they grow and sell a large variety of herb & veggie plants. They also grow all kinds of Flowers and have fresh cut Flowers available at the Markets most of the season. Tulips and Daffodils in the Spring, with Zinnias & Sunflowers all Summer! The seasonal products that are currently featured include a vast array of Apples and Pears, Winter Squash and Sweet Onions. If you can’t make it the Capital City Public Market on Saturday don’t fret, Waterwheel Gardens sells their produce to local restaurants: Fork, Alavita, Richard's, Modern Hotel, Juniper, State & Lemp, Camel’s Crossing, and Grit. What’s so great about the Capital City Public Market? Matt Williams says, “it brings together like minded producers who love what they do. We connect with each other through our passion for what we have chosen to do, and then we share that with those who visit our market” One can experience and taste the quality that goes into these products. Whether purchasing homemade hummus, tasting jalapeno lemonade wine, or finding unique crafted spoon rings; the Capital City Market has it all. Supporting the community and local vendors has never been easier. So grab your friends and family and head downtown this Saturday. The Capital City Public Market is located in Downtown Boise on 8th street, from State Street down onto The Grove Plaza, starting in Mid April, from 9:30 AM - 1:30 PM. On November 4th, the Market Board decided to move the whole Market off the street and onto The Grove Plaza! With all the construction that’s been going on there, the Market hasn’t been able to utilize that space for the last two years, but now that it’s finished, it’s the perfect place to bring everyone together for The Holiday Market, which will run every Saturday, 10:30 AM - 2:30 PM through December 16th. Tis the season for shopping local! If you’re new to the Capital City Public Market here are a few quick tips to navigating the various booths. Produce Vendors are on a seasonal rotation so not every type of produce will be available. All kinds of unique Artisan products! Stoneware, Metalwork, Photography, Leatherwork, Hand Blown Glass and more! Keep an eye out for local talent and musical events. Gluten Galaxy offers vegan and gluten free pastries and treats. Their gluten free buns can be found at local restaurant, Bittercreek Ale House. For more information about Waterwheel Gardens, visit their website at http://www.waterwheelgardens.com. Or stay connected at the Waterwheel Gardens Facebook Page. More photos of Waterwheel Gardens at the Capital City Public Market!